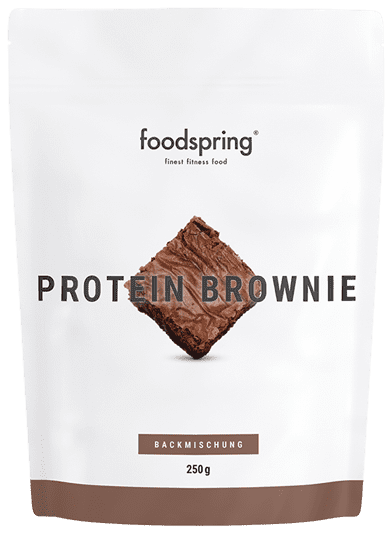 foodspring creates a holistic approach with premium products for the supplements sector and high-end fitness food for discerning customers - everything you need to fulfil your personal training objectives. You want to increase your physical strength and build muscles? 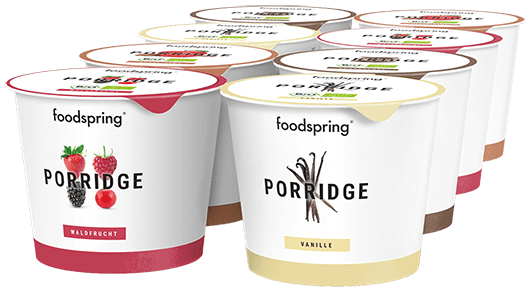 foodspring has just what you need. Our premium quality Whey Protein is made of milk from free range grazing cows, delivering the best possible protein - the basic building block for your muscles. Are you interested in body shaping? Our delicious Shape Shake will give you the nutritional support you need to achieve your goals. Want to improve your stamina or have set yourself ambitious goals like running a marathon or competing in the Ironman? Look no further - our vital substances will accompany you to the finish line. You don't have to have ambitious training goals or be a competitive athlete... 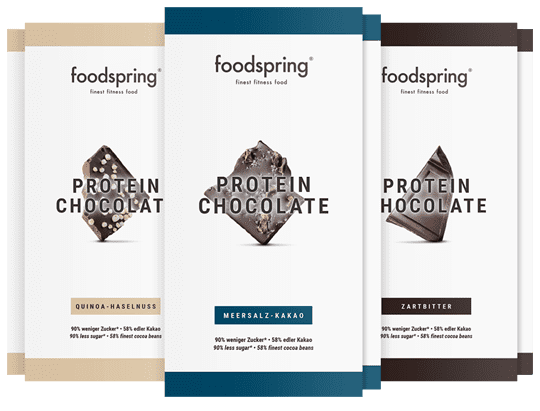 If you just want to have the best and improve your general health, foodspring offers ultra-healthy superfoods - the very best nutrition for a healthy body. foodspring is the perfect partner to help you achieve your training objectives. 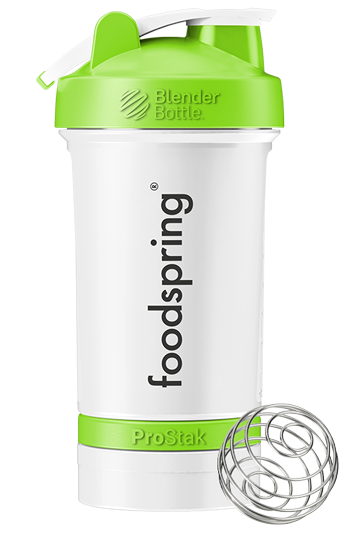 Every objective related to sports and health can be supported by foodspring products. We have developed food and food supplements that help everybody, in collaboration with experts from all disciplines. Intelligent weight training with regular progression is crucial for muscle building. You already knew that! But training hard is in vain without the right nutrition. Number 1 nutrient for power athletes: Protein. Protein shakes are an easy and delicious way to obtain your daily protein requirements. For example, our whey protein for quick replenishment after a workout. It is produced in Germany and is clean because the milk is obtained from cows raised on a plant-based diet. Vegans can also meet their protein requirements with premium shakes. Our vegan protein is natural and sweetened exclusively with stevia. Through the combination of 4 different plant proteins, it provides a biological value that rivals that of the animal protein alternatives. We also recommend essential amino acids to achieve your training objectives. BCAAs to protect the muscles, L-arginine for more power for your workout, L-glutamine for better regeneration and creatinefor real gains in strength. We only use the best ingredients such as Creapure® or arginine base. All formulas are laboriously developed, in order to achieve maximum bioavailability through optimal mixing ratios. Discipline in sport and restraint when it comes to eating is not easy, but achieving your target weight can be simple and enjoyable if you follow a few basic rules. Caution should be exercised with carbohydrates, as they can influence blood sugar levels and produce cravings. Fats should also not be consumed without restraint, because with 9 calories per gram they can quickly destroy the desired negative energy balance. You can comfortably work around this with protein. It prevents muscle loss caused by a calorie deficit and helps you form a leaner body. Our tried and tested Shape Shake contains a large amount of protein whilst keeping the fat and carbohydrate content to a minimum. It also contains L-carnitine. It makes a filling meal supplement or a great substitute for a sweet snack. Shape Caps are the complete package for long-lasting fullness and increased vitality in one product. Trying to lose weight does not mean you need to deny yourself enjoyment. We offer protein rich breakfast alternatives so that you do not need to forego food that suits your dietary needs even when you are under stress or in a hurry. Branched Chain Amino Acids (BCAAs) include the three amino acids (leucine, isoleucine and valine). The body does not make BCAAs and these must therefore be obtained from food. They can be found in all food sources of protein such as fish, meat or eggs. The trio is led by leucine as the dominant amino acid, which is why a goodBCAA mixture should have a ratio of 2:1:1. This amino acid sequence corresponds to the “natural” distribution in our body. This ensures that the BCAAs supplied can be optimally used as direct energy sources. Many endurance athletes tend to focus on carbohydrates and neglect protein intake. Proteins are also extremely important for long-distance runners and support muscles during activity. Protein shakes meet these demands in a convenient and delicious manner. The amino acid L-arginine improves the supply to the muscles when under strain and thus increases the effectiveness of the protein. Studies have also shown that L-arginine increases the anaerobic threshold during endurance activities - moderate activities like jogging can also be kept up longer. Is your health important to you irrespective of any thoughts on performance? Do you live a vegan lifestyle or value organic and locally produced goods? foodspring is your ideal partner on the internet. We will meet your expectations, whatever they may be. We know that only the best products are truly beneficial to health and wellbeing. This is why our superfoods or nut and berry mixes are exclusively organically sourced. For our Crunchy Fruits, as for all our Fitness Food: We retain as many nutrients as possible through new processing methods. That truly makes us different. The daily vitamins and Zn:Mg compounds supplement natural food products. Discerning customers can finally find the quality that they are looking for. We are proud of first-class ingredients and special formulas.